Steven (Chicagoland, United States) on 27 August 2014 in Architecture and Portfolio. Old St. Patrick's Church, also known as St. Patrick's Roman Catholic Church and commonly known as Old St. Pat's, is a Roman Catholic parish in Chicago, Illinois. Located at 700 West Adams Street, it has been described as the "cornerstone of Irish culture" in Chicago. The main church building is one of a handful of structures remaining in the city that predate the 1871 Great Chicago Fire, and is the city's oldest standing church building. Old St. Patrick's Church was founded on Easter Sunday, April 12, 1846. The parish was originally housed in a wooden building at Randolph Street and Des Plaines Street. In the 1850s, the present church building was constructed of yellow Cream City brick from Milwaukee. Two octagonal spires, said to represent the Eastern Church and the Western Church, were added in 1885. 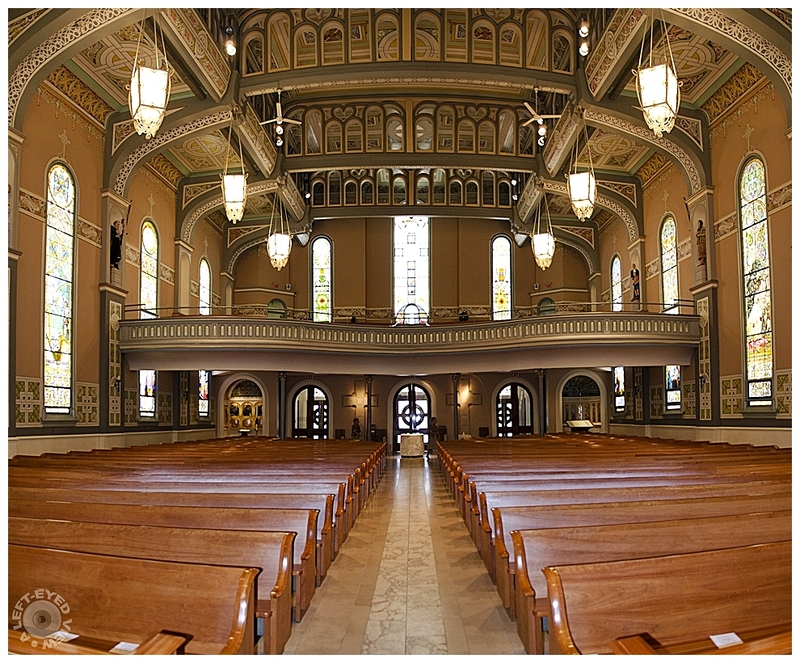 By the 1880s, most of the parish was composed of Irish-Americans, and from 1912 through 1922, the interior was redecorated by Thomas A. O'Shaughnessy and others in the Celtic Revival style. O'Shaugnessy modeled some of the ornamentation after the illuminations found in the Book of Kells. The building was added to the National Register of Historic Places in 1977. We arrived early for a wedding that day which afforded me the opportunity to take some photos before everyone else arrived. Photo captured August 9, 2014.
with beautiful frame, perspective, colors 7 lighting! So beautiful ! Superb framing and tones . Tout est magnifique et parfait. Of very beautiful colors, I love her style! Upstairs is for the choral ? @Patrick M.: The services here can get very crowded and parishioners occupy the balcony area. The choir is situated in front, to side of the altar. Again the same fantastic quality of light and colors. The great light flowing in through the windows really brings out the details. The architecture is just gorgeous! I love the balcony, the windows and the lights. A beautiful image! Beautiful capture of this very interesting architecture. Another superb image - beautiful control of light and exposure you manage here. A fine capture of the grandeur and size of this sanctuary. It's remarkable that it survived the fire. Quel intérieur d'église quel rendu sur le banc de bois et cette architecture superbe. Impressive detail in the distant balcony and ceiling. The top seems undistorted, but your wide angle view makes the aisle look like a ditch with the pews sloping down to it.... an interesting effect. Something so cohesive about the colors here . . it all belongs as 'one'. You really do a nice job with the interior light. What a gorgeous place. I love the wonderful clarity in this beautiful image.